Speaking at the second edition of Myanmar-India Business Conclave, India’s Minister for State Commerce & Industry Shri C R Chaudhary reiterated India’s commitment to the Look East and Act East policy. From India’s perspective, Myanmar is the gateway for south-east Asia and accords the highest priority to deepen trade and investment relations with the country through regional value chains and integration. Minister pointed out that area of collaboration can include sectors like agriculture and agro-processing, power and infrastructure, pharmaceuticals, health services, education and skill development, ICT and IT related services. As part of Act East policy, the Government of India is establishing project development fund to identify the feasibility of investments in sectors like super speciality health services in the CLMV countries. U Aung Htoo, Deputy minister for commerce, Government of the Republic of Myanmar pointed out that the NLD government is committed to the economic and trade reforms initiated in the country in 2011. The government’s 12 point economic policy identifies the role of export-led growth, private sector development, employment creation and poverty reduction as the focus. Investors can benefit from incentives and tax holidays, SEZ facilities and LDC benefits for exports in Myanmar. A high proportion of young people, emerging middle class, IT penetration are significant for Myanmar which can be harnessed by the private investors. The need for infrastructure improvement is needed in order to reduce transaction cost. In his introductory remarks, Mr Vikram Misri Indian Ambassador to Myanmar pointed out that for Indian investors this is the right time to invest in Myanmar. “Opportunity in Myanmar is everywhere”. The country is in transition, and it gives an opportunity for private sector to explore the partnerships with the local businesses. The government of India accords significant value to the relationship with Myanmar as part of its act east policy. The collaboration of the government in improving connectivity is significant, and investments are made in hard as well as soft infrastructure regarding transport connectivity as well as human resource development in the country. Pointing out the significance of institutional mechanisms for business communities of both countries to interact, he pointed out the formation of India-Myanmar Chamber of Commerce as a significant initiative that would enhance cooperation and communication. Speaking on the occasion, vice president of UMFCCI Dr Maung Maung Lay pointed out that as an apex body of private sector it is committed to play a facilitative role in forging partnerships between India and Myanmar businesses. Given the strategic position of Myanmar as an entry for India to ASEAN and GMS region, it is important that India participate in the transformation of Myanmar. Chairman of Confederation of Indian Industry – International Council Mr Naushad Forbes laid out plans of CII to collaborate with Myanmar business and investment community. They include vocational and management training institute as the centre of excellence, entrepreneurship training and setting up of CII office in Yangon. 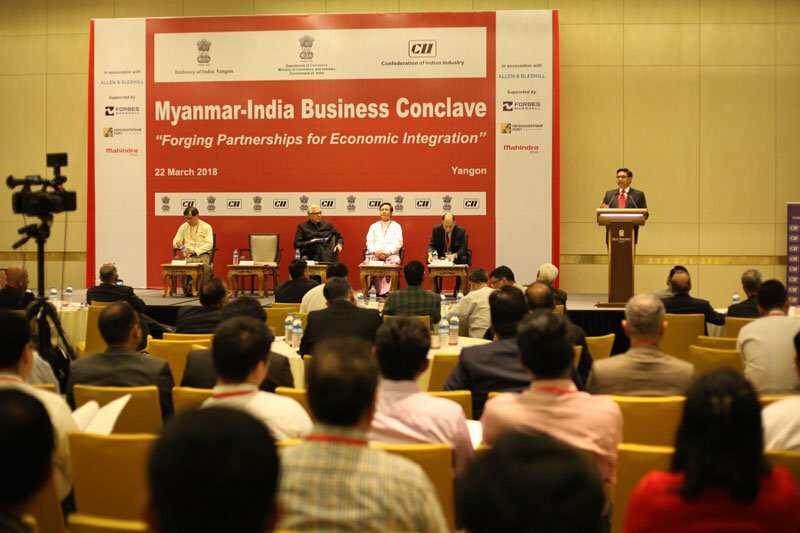 The conclave brought together Myanmar business leaders and a high-level delegation of 23 Indian CEOs who are on a visit to Myanmar to exchange views and build partnerships with Myanmar counterparts.